Tired of the same beer, year after year? Sign up for La Bodega’s Beer Club and receive a selection of exciting new beers every month. Many of these beers have never been seen in Alaska. If you’re interested in expanding your palate and knowledge of fine suds, this is the club for you. Number of bottles will vary, as the beer will come in different sizes. Your credit card will be billed the 1st of every month, but please wait until you receive an email from us letting you know when your club purchase has arrived. This Month's Beer: Click to read about Beer Club selections for April! Club sign ups are available through the shops. 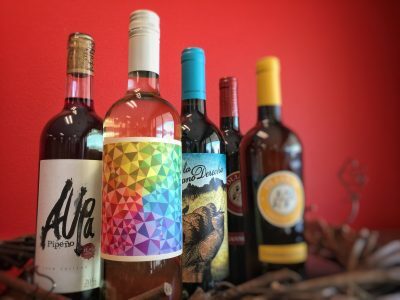 Keep your shelf stocked with unique, quality wine by signing up for La Bodega’s Wine Club. Wine Club members receive two different bottles of fantastic wine each month. Wines are hand-selected by Nikole. Everyone deserves fine wine, all of the time. Your credit card will be billed on the 1st of every month, but please wait until you receive an email from us letting you know when your club purchase has arrived. This Month's Wine: Click to read about Wine Club selections for April! New! The first Saké Club in Alaska! Saké is a growing industry across the globe, and this includes Alaska. Whether you already love Saké or are just starting to explore this craft, Saké Club is great! Kanpai! Your credit card will be billed on the 1st of every month, but please wait until you receive an email from us letting you know when your club purchase has arrived. This Month's Saké: Click to read about Sake Club selections for April!